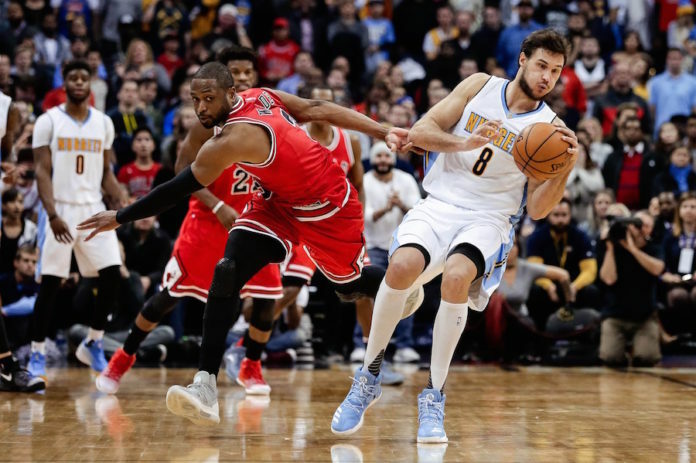 The Denver Nuggets welcomed Dwyane Wade and the Chicago Bulls to the Pepsi Center on Tuesday evening, and a battle it turned out to be. 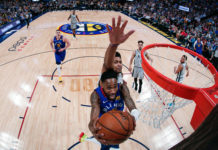 The Nuggets were finally on the opposite end of a nail-biter, as they won in the final seconds by a score of 110-107. The Nuggets went 3-1 in their four-game home stand after starting the year off 0-3 at the Pepsi Center. 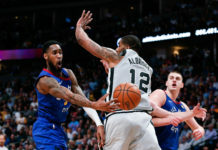 Balance was the key for the Nuggets, as they had six players score in double figures and once again won the rebounding battle. While the game was the event, Dwyane Wade was the story. 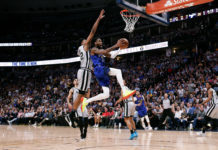 Prior to the season there was plenty of speculation of Wade to the Mile High City on a two-year, $52 million offer, as the Nuggets courted Wade in the free agency period. Some believed that it was just smoke and mirrors to force Wade and the Miami Heat to come to a lucrative deal, but before Tuesday’s game, he cleared the air and stated that him in a Nuggets uniform was a real possibility. Wade scored 22 points and had three rebounds in the loss but had high praise for the young Nuggets team. Wilson Chandler is having himself a good year early on. He scored 16 points with nine rebounds against the Bulls on Tuesday. The big men have been getting it done, as well. Nikola Jokic scored eight points and pulled in eight rebounds, while Jusuf Nurkic recorded a double-double, with 14 points and 14 rebounds. Will Barton, in his second game back from an ankle injury didn’t shoot relatively well (3/13), but he did score 10 points, none of them more crucial than the last two free throws to put away the game. It was a career night for rookie sensation Jamal Murray, too, as he had his breakout game and the best game of his young career thus far. He finished with 24 points (9-13 FG, 3-4 3FG) and six rebounds. Wade was complimentary of the rookie. It was a phenomenal game for the rookie as he lifted the Nuggets to victory. With Murray having early success and the other young players stepping in and performing well, it appeared to be a nice glimpse of the future and what could be for this young Nuggets team, at least Wade seemed to think so.